"After however many weeks it has been, a package from Yaesu showed up on my doorstep tonight. After repairing a damaged PCB trace (non trivial on something this small), I was able to replace it. 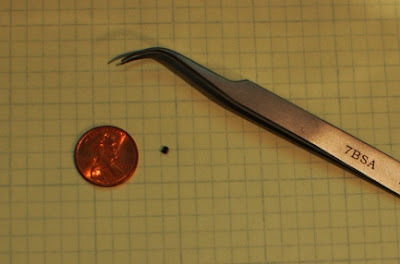 The little black speck in the middle of this photograph is the removed component. For my non-US readers, the US 0.01 USD coin (“Penny”) is about 19 mm in diameter." While the description is good, a picture (from his web site) is worth a thousand words. Boy howdy is that small!